This letter was written by William Elmore Howard (1844-1864) from Concord, Essex County, Vermont, the son of William Sumner Howard (1821-18xx) and Lucinda F. Gorham. Elmore wrote the letter to his brother, George Sumner Howard. Elmore was mustered into the 17th Vermont Regiment, Co. G, 12 April 1864. 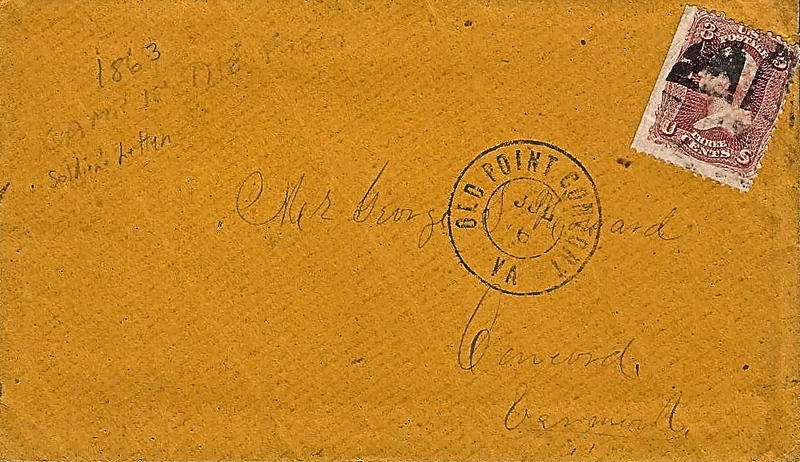 When he wrote this letter on the Fourth of July 1864, he was in the trenches before Petersburg. 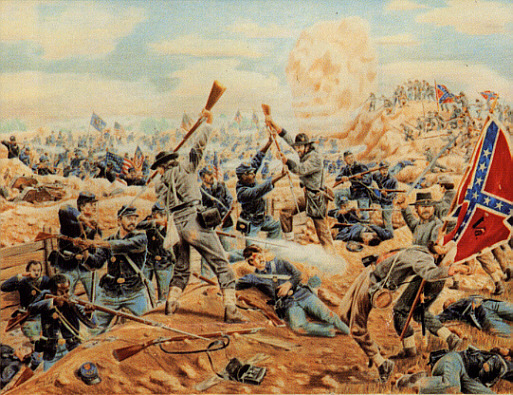 He was taken prisoner during the failed attempt to take the confederate works at Elliott’s Salient on 30 July 1864 in what has since come to be called the Battle of the Crater. Sadly, Elmore died in a Confederate prison camp at Danville, Virginia, on 4 December 1864. See Book. It is with pleasure that I seat myself to write you a few lines just to inform you that I am still in the land of the living and am enjoying pretty good health and hope these few lines will find you the same. I write today to have you send me some paper and envelopes. Charley is going to write today for some and you can put mine in with his. I think half a quire of paper will be enough. I should like to have you send me some of those white envelopes such as you send me in the letters that you write me. If you have not and if you have sent me money, I wish you to keep sending until you send me as much as five dollars. We have got a sutler now and he keeps butter & cheese and pie and a good many things that are good for a fellow and as for me, I’ve been fed on hardtack so long I will have them if they do cost high — that is, if I can get the money. Mr. C___ane got a letter day before yesterday morning that was wrote the 26th and his folks wrote that Fed. Judnine was dead. Of course her father and mother feel dreadfully about it. When mother wrote the last line which was the 23rd, she said you and father were at work on the mountain road. What road is it? and whereabouts? Please write all about it and how you came to go to work on it and all about it. What have you got for horses and what do you drive? Has the mare got a colt and has she got a good one. How do the colts look this summer? Have you found out yet how much father got for old Jack? Does Faloona keep him yet? And how does he look? I suppose you think of going to haying soon. Who are you going to have help you? Write how the hay crop look and how high wages are and all about it. I want you to write and let me know how you are spending the Fourth [of July]. I will try and tell you a little how I am faring today. Our regiment was relieved from picket last night just after dark and today we are lying back in the woods — not out of the reach of bullets by any means. We have what I call “fraid holes.” I will try and describe one. The one that I occupy in company with Rob Avon [?] and Charlie is about five feet square. 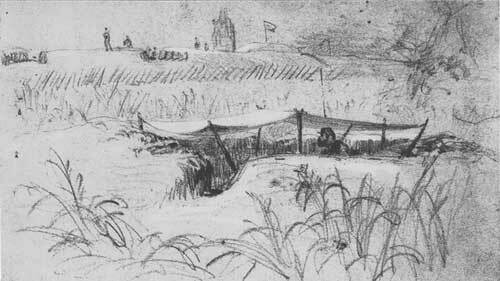 It is dug down about two feet and logs laid up on the two sides towards the rebs (it stands cornering toward the rebs). It is laid up three or four small logs high. The dirt that was taken out of the hole is thrown outside the logs and so makes a breastwork. This morning I put in some fresh leaves and put our tent over the top and so we have got quite a house. A & V and I are writing on a cheese box with the ink between us. It is very still here today along the line. I tell you it don’t seem much like the fourth of July. I must tell you what I had for dinner for I have eaten dinner since I commenced this letter. I had some bean soup and hardtack and soft bread and butter. We have [been] served soft bread only once before since we left Alexandria last May. Now be sure and send me the money if you haven’t sent it already and the paper and envelopes you can put with Charley’s. I am on the last dollar and that is slowly but surely fading away. Some stamps would be gratefully received.